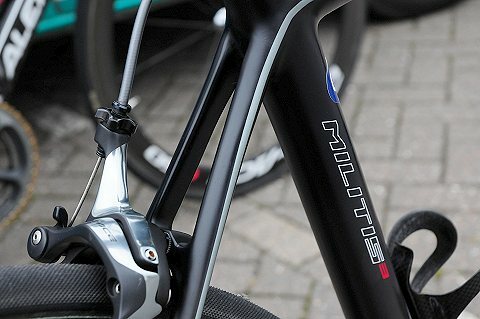 Last weekend at the Stockton Grand Prix, won by Graham Briggs on his Militis, VeloUK took a look at the bikes. 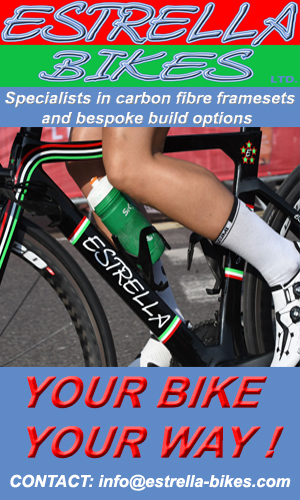 Itâ€™s a full carbon monocoque which when fully loaded with all the bits and pieces weighs in at only 7.14 kilos. 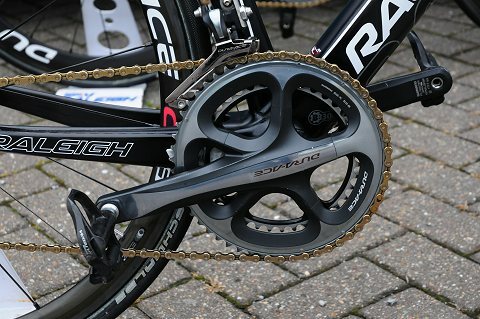 The group set is 10 speed Shimano Dura Ace (non electric for nearly all the bikes) and they have the choice of Dura Ace C35 or C50 carbon deep section wheels. 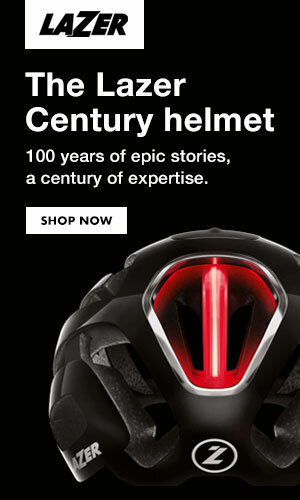 The training wheels are Ultegra and they are clinchers. 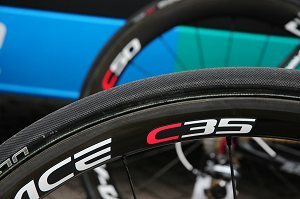 The Dura Ace ones though have tubulars on them, Schwalbe (22 or 25). 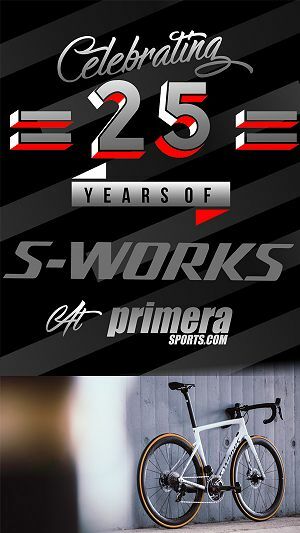 Pete Mooney, their hard working mechanic says they mainly use the 25 for the crits and races with dodgy surfaces. The size of the frames used by the team range from a 47 for Graham Briggs to a 59 for Jamie Sparling and lots of sizes in between, 50, 53, 55 etc. 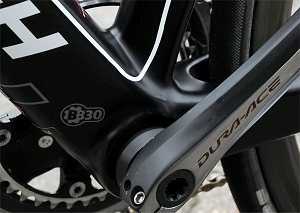 Labelled up on the frame is the name, BB30 which is a very simple system for bottom brackets. Pete explained how it only takes about four minutes to put one in which is a lot quicker than the good old days of screwing cups into the shell of the bracket and then placing individual bearings in. 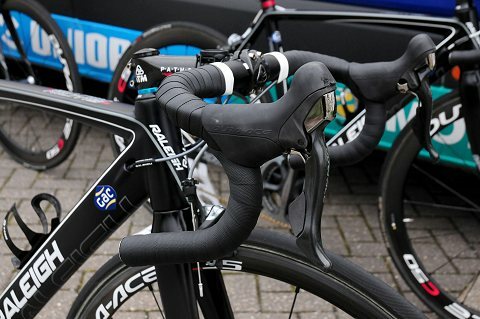 â€œThere are a couple of circlips, two bearings, two caps; push everything through and tighten it up the other side.â€ Other components include ITM bars, stem and seat post with a San Marco saddle. The chain is KMC. 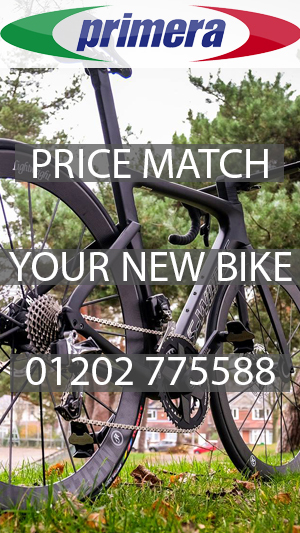 The Raleigh team bike uses different components to the US version and Raleigh UK are said to be bringing out a UK version of the Militis as part of their 2013 range. Look out for news of that in the coming months! 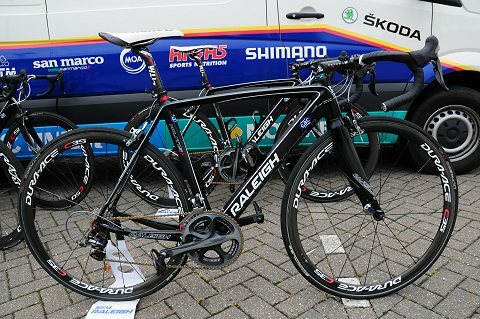 Grahamâ€™s other bike is the SP Team Dura Ace bike for training. Itâ€™s being sold in the UK this year at Â£3,900. 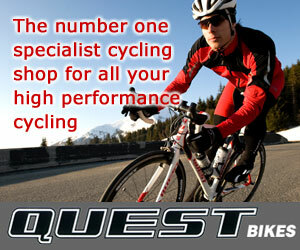 There is an Ultegra version available at Â£2,450 and is said to be great for racing. 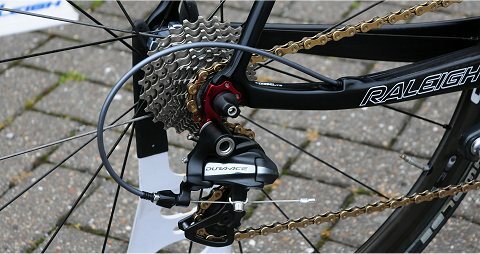 The SP Team Dura Ace was reviewed in Cycling Plus recently, picking up 4.5 out of 5. Talking to Graham before he went out and won the Stockton Grand Prix about why he has chosen the electric Shimano gears for his bike, he mentioned that after heâ€™d won the British Circuit Title in 2011, he was after a nice bike and that included the electronic gears which he says enables him to shift gear while on the drops. 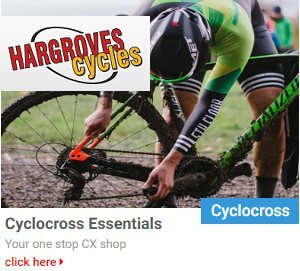 Graham added finally that using the electric gears you can be in or out of saddle and applying pressure to the pedals making it more versatile than the normal system. Bottom line was whether Graham, if money was no object, choose electric over the normal gears? He replied the â€œDi2â€.